This latest edition of the ITMB map of Mali has had a complete cartographic face-lift. The hypsometry (contouring colouration) is much more sharply defined, the rivers more visible, and the roads are well defined based on quality. Distances between points is shown in kilometres. 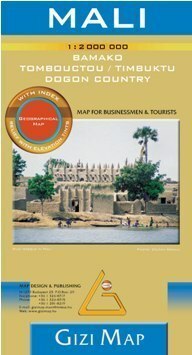 The map includes decent insets showing street plans of Bamako, Central Bamako and Timbuktu. Some roads in Senegal, Niger, Burkina Faso, Benin, Ghana, Togo and Nigeria are also shown. A range of symbols and graphics indicatepoints of interest, airports, ports, medical facilities, accomodation, wells, UNESCO World Heritage Sites, campsites, museums, border crossings, antique sites, mines, churches and so forth. Some spot heights are shown along with some facts and history on Mali, diagrams for travelling distances and unit conversion rates.